For every national initiative to stimulate green building, for every energy leader encouraging Houston businesses to expand what it means to be called “the energy capitol of the world,” the reality of making it happen comes down to this: finding construction workers who can implement or in some cases fabricate the new technology. Without laborers, the green ideas remain just that. One of the most exciting economic development tools happening in the Greater East End Management District involves training East End workers – some just out of high school and others with years of construction experience — to install solar screens, make existing buildings energy efficient and build green from the ground up. The training takes place at SER—Jobs for Progress of the Texas Gulf Coast, located in a building next to the Port of Houston. In a large, open classroom filled with construction materials and work tables, the newest green job skills are taught, and students are being hired and dispatched to jobs in the East End and throughout greater Houston. Rey Guera, director of Energy Programs at PMG, has hired numerous graduates from the program. Last year, 90 percent of his new hires came from SER, he says. The need for skilled workers is on the rise, and SER is helping to meet that demand, he says. “Houston is very much in the forefront on this green movement. There are only a couple of companies who do it, but it is absolutely booming,” Guerra says. PMG’s projects range from residential to commercial, from low-income weatherization projects supported by the City of Houston to high end construction that draws on the latest technologies. SER currently teaches basic green construction and painting, weatherization, heating, ventilating and air conditioning and installation of solar panels. Students earn $12 an hour and train 40 hours per week for two weeks for Residential Energy Conservation Worker training. Green painters attend a one-day workshop. The training, funded by a Department of Labor grant, has the potential to change students’ lives for the better, in addition to making a positive environmental impact, says SER Director Nory Angel. “You are training someone with skills that are going to put them on a career path as opposed to staying in a dead end job,” she says. An added benefit beyond making a worker more marketable is that many may wind up applying these new skills in their own homes and neighborhoods. 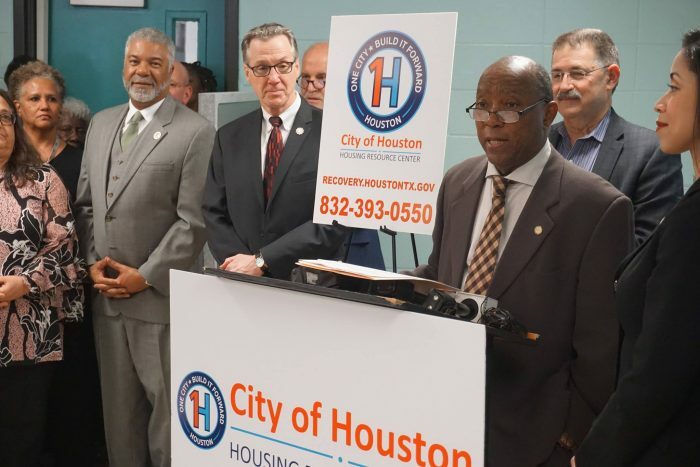 Angel hopes that word spreads about the City of Houston-CenterPoint Energy program to provide weatherization to low-income citizens’ homes for free. Not only will the improvements help cut utility bills and increase property values, the work will help ensure the need for SER-trained workers will increase. Already, 600-plus graduates have finished their training, and many of them have been hired. Companies can contract directly with SER to train existing workers as well. Greater East End Management District president Diane Schenke said the SER training is vital to the area’s growth and development. “It’s a way to get the workforce ready for future development and to help local businesses jumpstart a new phase of revitalization that benefits everyone,” she says.